Hyenas (Hyaena spp. ), with their wild laughs and striped or spotted fur sprouting in strange patches all over their bodies, are not as closely related to dogs as dingos are. While often feral, dingos are actually a member of the Canis genus, to which the common dog also belongs, whereas hyenas are wild. 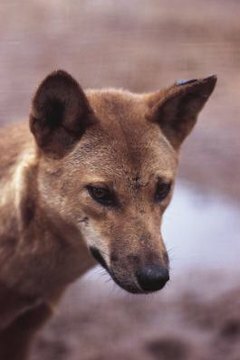 Dingos (Canis dingo or Canis lupus dingo), one of the best-known breeds of wild dog, are predominantly found in Australia. They also make an appearance in Southeast Asia, however, and this may be where they originated. It is possible they arrived in Australia 15,000 years ago when they came with the Koori people, or only 3,000 to 4,000 years ago, when traders brought them from the Asian mainland. Hyenas, on the other hand, are native to Asia and the Middle East as well as Africa, though we primarily associate them with the arid plains of Africa. While there is only one species of dingo, there are four species of hyena. Dingos like to be close to water, living in family groups or by themselves. They give birth only once a year, after which the mother dingo nurses her puppies for two months and then regurgitates food for them for another two months. Dingos are ready for independence when they are between 6 and 8 months old. Hyenas, on the other hand, nurse for almost a year, although after the pups are a month old their mother brings meat back to them. Especially when caring for young, hyenas live in dens. Dingos and hyenas both have pointed ears and long tails. While the dingo might be mistaken for a dog, the hyena usually is not. Its upturned snout, outlandish fur and sloped hindquarters are distinctly exotic-looking. Because of the dingos significantly more doglike look, it has been known to be adopted as a pet. Hyenas, on the other hand, are less likely to be taken in by humans, although one man in Ethiopia has trained a hyena to guard his livestock. Dingos will eat a variety of foods, but prefer meat above anything else. They have been known to eat lizards if other small prey isn’t available, and when options are limited will band together in larger groups to hunt bigger game, such as kangaroos. Hyenas like the striped hyena hunt for smaller game and scavenge large game, primarily at night. Hyenas are not opposed to foraging for food through garbage dumps or other sites of human refuse.